﻿ The Israel Conference - May 31 & June 1, 2012 - Los Angeles, California - Save the Date! Buy Tickets for The Israel Conference™ 2013 ! The Israel Conference™ is a fast-paced business conference showcasing the vitality and growth of Israel-facing business through a variety of panels on hot industry topics and trends with world-class speakers and high-quality networking. The Israel Conference™ brings together leading innovators and investors High Tech / Entertainment Media / Advertising / Mobile / Content / Gaming / e-Commerce / Energy / Clean Tech / Security / Medical Tech / Consumer Products that are coming out of Israel that are market-making and in demand. Who Presents: The Israel Conference™ features CEOs, Presidents, and Founders of significant businesses that are Israel-facing that were founded in Israel, have R&D operations in Israel, do business in Israel, or represent investors in Israeli companies. Speakers represent the spirit of the inventiveness of the Israel market from publicly-traded companies, emerging growth, and early stage. Who Attends: The Israel Conference™ attracts business leaders who want to expand their circle and personally meet CEOs of Israel-facing businesses. Over 40% of the attendees are C-level. Why: By attending, you will meet with top minds of the movers and shakers of comapnies with the most forward-thinking technology and products in the world. Attendees gain an insider's understanding of the growth of dynamic Israel-facing companies. 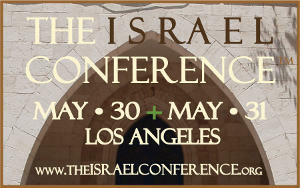 When: The Israel Conference™ takes place in Los Angeles on Thursday May 30, 2012 + Friday May 31, 2013. The Pavilion of Companies is a high-energy expo zone in the center of the networking area where companies with great technology and products and services meet with attendees and demonstrate all day long at The Israel Conference™. An exciting part of the day for companies with a 'wow factor' to show their company's product or technology application in five minutes to the entire audience from the Main Stage. Great CEOs, CTOs, or Founders of innovative companies are invited to present throughout the day. An exciting arena where the latest technology and consumer products interact with a panel of world-class Judges and the audience involvement is spectacular. A fantastic opportunity to present your unique technology or products to hundreds of business executives.